Keyhole gardens are more than just circular, raised-bed gardens; they were designed by a missionary with the goal of having a productive and successful garden even in locations with poor soil, limited water and limited space. One of the unique things about a keyhole garden is its namesake – the keyhole. Notice the pie cut out of the circle. It’s a cutout so you have easy access to the chicken-wire compost basket in the middle of the garden. That basket is where the magic happens, because it is where the compostable material needs to go. 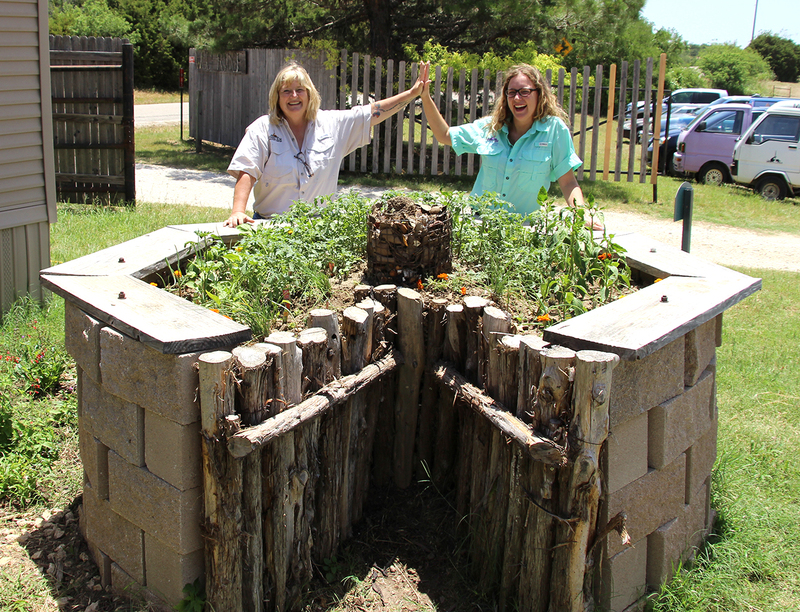 Fossil Rim Director of Education Tessa Chenoa Ownbey (left) and Recycling and Waste Conversion Coordinator Caitlin Pyle have both of the wildlife park’s keyhole gardens thriving, and they are excited for guests to learn more about the benefits of this particular garden design. 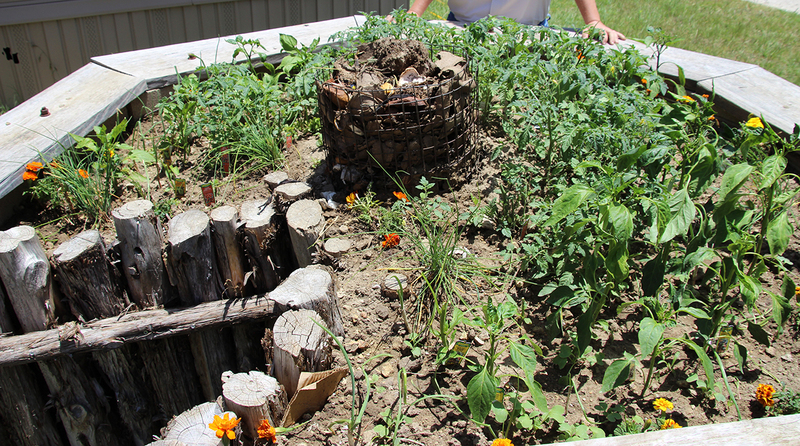 This is the garden at Wolf Ridge Nature Camp, and it was first built in 2013. As food scraps or gardening scraps are collected in the basket, over time they break down – or compost – to release a significant amount of nutrients into the soil while keeping that organic material out of the landfill. 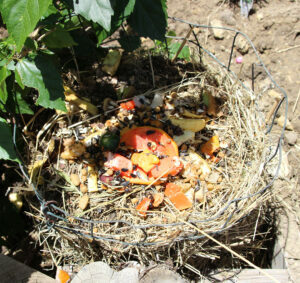 As the compost breaks down, we continue to put more scraps in the basket. A second unique aspect of a keyhole garden is found below the surface. Atop enough wet, flattened cardboard to fill a dumpster, there is about six inches of topsoil to cover the cardboard and do planting within. Eventually, all of it will compost down into soil. 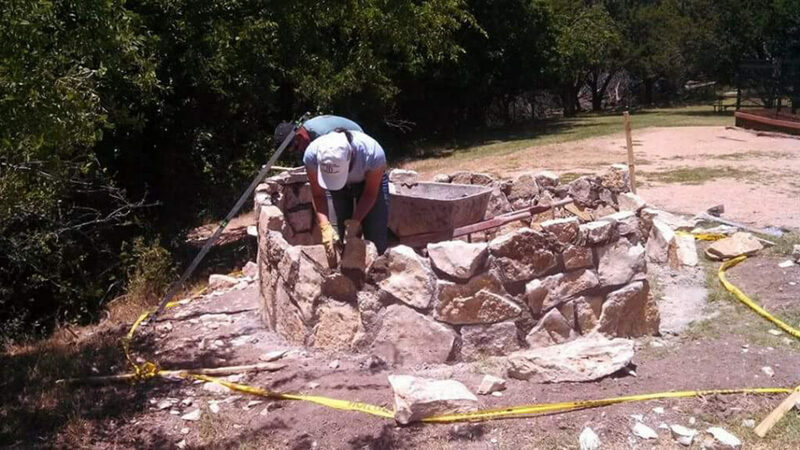 After the Wolf Ridge keyhole garden was built in 2013, plans for another one at the CAC got underway in 2014. Tessa Chenoa Ownbey worked with past interns in the building of both gardens. The rock-and-mortar base of the CAC keyhole garden is constructed in 2014. In conjunction with the scraps from the chicken-wire basket, this will compost to create high-quality soil for the plants. So, you basically have a garden planted on a hot compost pile, thus you can utilize your keyhole garden year-round! When a keyhole garden is planted, it can hold far more than a tradition garden of that size, plus it requires a fraction of the water needed by a tradition garden. For example, a keyhole garden can accommodate 70 tomato plants in a space with only a six-foot diameter. The standard size of a keyhole garden is six feet in diameter, or a three-foot radius from the edge to the compost basket. This is the perfect size to disperse water and nutrients. They are six feet in diameter so that everything is in reach, plus it’s the perfect size to disperse water and nutrients. We try to capitalize on all the space, so we cover the entire garden with plants. 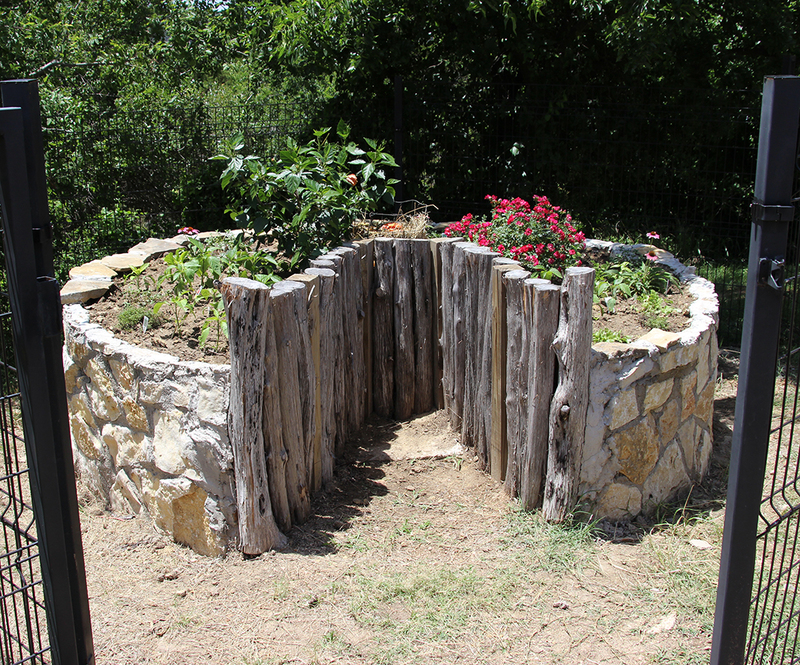 Fossil Rim Wildlife Center has two teaching keyhole gardens that are planted with edible vegetation. One garden, which was built in 2013, is located at our Wolf Ridge Nature Camp and filled with tasty plants like jalapenos, cherry tomatoes and onions for people to eat. This is the compost basket for the garden at Wolf Ridge Nature Camp. If the education staff has some scraps left over from breakfast or lunch, they will just toss them in. Marigold flowers are a “catch crop” in the keyhole gardens because insect pests are attracted to them over other plants in the garden. The base of this keyhole garden is made of cinderblocks, and it is taller than the CAC version. 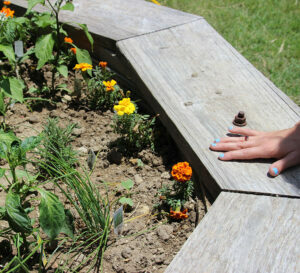 Camp Manager Ellie Helton assisted with the planting in this garden. The second keyhole garden, which is located next to our Children’s Animal Center and was created in 2014, is brimming with plants for our birds, goats, turtles and the pig to enjoy such as hibiscus, bell peppers, flowers and spices. This is the keyhole garden at the CAC. It is lower to the ground than the one at Wolf Ridge, but still high enough to conveniently work while standing up. “Our volunteer Nadia Lambert helped us out with this one,” Ownbey said. The base of this one is rock and mortar. This one is shorter so the children have easier access to check it out, but we have a high fence around it to keep the deer out. The height of the base really doesn’t matter for these gardens. The key is just to have the layers of cardboard and then six inches of soil on top. Caitlin Pyle illustrates the purpose of the keyhole design – easy access to the chicken-wire compost basket. Note the fence in the background, which helps keep out white-tailed deer that sneak onto Fossil Rim property. “You try to prep the whole garden in one day, from the cardboard to the planting, so you are sealing in all that moisture,” Ownbey said. One reason we appreciate having these gardens is they provide an educational opportunity for our visitors who have not seen or even heard of a keyhole garden. Also, they promote two pillars of Fossil Rim’s mission statement: meaningful public education and the conservation of natural resources. 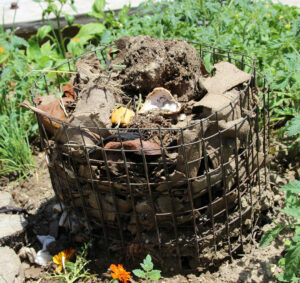 This is the chicken-wire compost basket in the middle of the CAC keyhole garden. 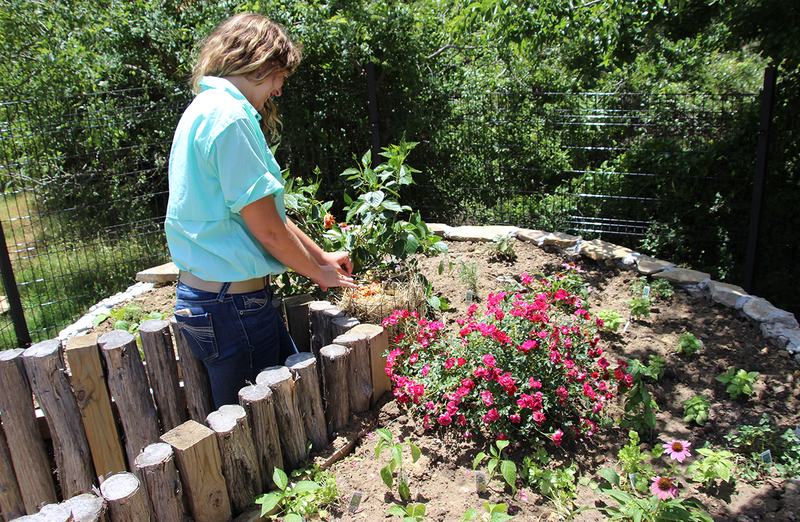 While the Wolf Ridge garden is geared toward human food, the CAC garden is grown for the animals at that facility. If you want to get a better look at our keyhole garden firsthand, you can stop by the Children’s Animal Center anytime the Overlook area is open and see what our animals are going to enjoy munching on! 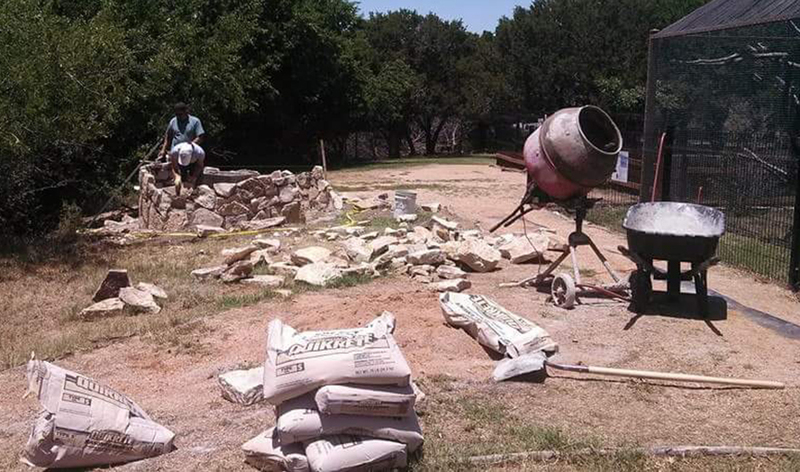 If you have questions about keyhole gardens, you can email us at education@fossilrim.org.